Browsing through Facebook this past week we came across this awesomely cool image by David Kommel of autoimagery.com. 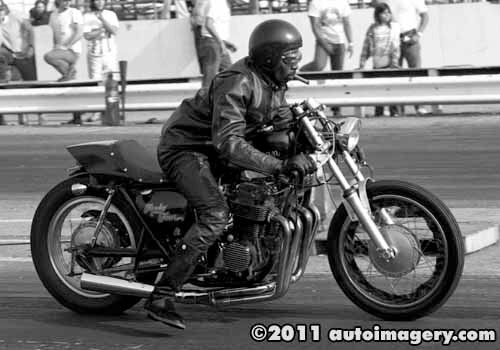 Tommy said he was there when this picture was taken at Irwindale drag strip in southern California and the guy on the bike was known by the name of “Black Scotty”. Tommy thought the picture was from around 1974. It seems Black Scotty (Tommy never knew his real name, that is what everyone called him) used to contract ride for several bike shops in the area including Cycle Boutique. He loved to ride two-stroke Kawasaki's to the local hangout called “The Pastrami Stand” at Adams and Crenshaw. We here at Tombo Racing think this picture of Black Scotty is the epitome of “cool”!